A kangaroo hop from the Grampians National Park is Wildwood Wildlife Shelter who provides a safe and peaceful haven for the rehabilitation and release of sick, injured and orphaned Australian Native Wildlife. 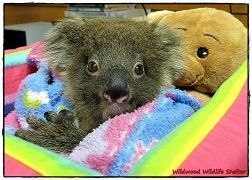 Wildwood Wildlife Shelter operates 24 hours a day, 7 days a week, covers a 50km radius and is dedicated to the Rescue, Rehabilitation and Release of sick, injured and orphaned native wildlife indigenous to the Southern Grampians of Victoria. 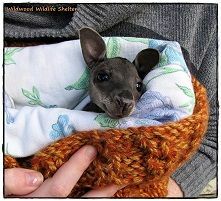 Since 1995, over 70 different species of wildlife have been cared for. Wildwood is self-funded and operated by volunteer carer Pam Turner. 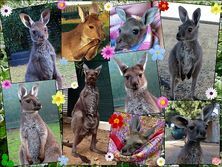 Wildwood Wildlife Shelter specialises in macropods (kangaroos) and is on 700 acres near the southern end of the Grampians, which makes it possible to soft release and therefore monitor the animal’s progress. Pam has witnessed 5 births and watched all 5 grow and take their place in the mob as young adults. Over the years she has learned much about their behaviour, and gained a better understanding of their needs, by observing the wild mob. 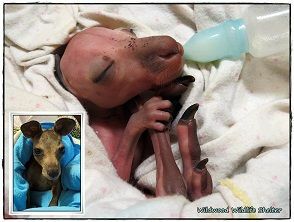 Wildwood Wildlife Shelter is entirely self-funded, as are most wildlife shelters in Victoria. 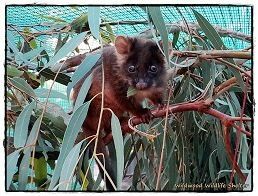 We are issued a Shelter Permit by the Dept of Primary Industries and Environment which allows us to provide care for any native animal in need. We mostly operate from our own homes and, as long as we adhere to the Code of Practice for the Welfare of Wildlife during Rehabilitation and fill in our rescue records, it’s up to each Shelter Operator how many animals we take into care, the different species we are willing to look after, and how many hours we want to put in etc.